September offers cooler weather, colorful foliage, and NATIONAL APPLE MONTH! 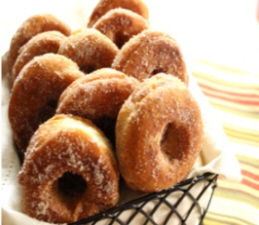 Our great friends over at Sparkling ICE sent over this yummy looking recipe for homemade apple cinnamon donuts! I think I will try to make them next weekend! Yummy! With the mixer on slow speed add the flour, baking soda, baking powder, and salt until just combined. The dough should look shaggy.Slowly pour in the remaining amount of Sparkling ICE on medium speed for 2 minutes. Tear 2 pieces of parchment paper the size of a baking sheet.Line the first piece of parchment on a clean baking sheet and heavily dust with flour.Turn out the dough onto the floured parchment and press evenly till its about 3/4 inch thick. (If the dough seems too sticky flour your hands before pressing.) Lightly flour the top of the dough and place the second piece of parchment over the dough. Refrigerate for 3 hours or overnight. Combine cinnamon and splenda in a large bowl. While the donuts are still warm, toss with cinnamon and splenda mixture until evenly coated. Serve warm. Disclosure: The photograph and recipe is courtesy of Sparkling ICE.